Abstract : Tonnetze are space-based musical representations that lay out individual pitches in a regular structure. They are primarily used for analysis with visualization tools or on paper and for performance with button-based tablet or tangible interfaces. This paper first investigates how properties of Tonnetze can be applied in the composition process, including the two-dimensional organization of pitches, based on a chord or on a scale. We then describe PaperTonnetz, a tool that lets musicians explore and compose music with Tonnetz representations by making gestures on interactive paper. 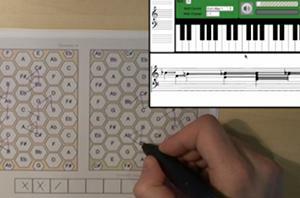 Unlike screen-based interactive Tonnetz systems that treat the notes as playable buttons, PaperTonnetz allows composers to interact with gestures, creating replayable patterns that represent pitch sequences and/or chords. We describe the results of an initial test of the sys- tem in a public setting, and how we revised PaperTonnetz to better support three activities: discovering, improvising and assembling musical sequences in a Tonnetz. We con- clude with a discussion of directions for future research with respect to creating novel paper-based interactive music representations to support musical composition.